Mind cannot be emergent. Something which is emergent cannot experience, decide and cause. From where did you arrive at the above conclusion? Mind is a physical state if it is due to physical activity. A physical state simply cannot experience another physical state, taste of salt. You are being rhetoric in mixing and conflating too many element in the above. 1. "A physical state simply cannot experience another physical state, taste of salt." I agree if the above physical state [emergence] is related to non-human states. 2. " Mind is a physical state if it is due to physical activity." You are being deceptive here. Mind is not a physical state is as in 1 above. Mind is a human mental state emerging out of physical states. A mental state can experience, i.e. taste of salt. The human body is made up of specific physical elements. The fact that such a combination of body parts can culminate in thinking, planning, experiencing, making decision imply there is an emergent. That emergent is conveniently label as mind. We can even switch it [mind] off to some extent with anesthetic. That, anesthetic, is not a proof for mind being emergent. I did claim it is the proof. Anesthetic is a clue and an indirect inference. What is wrong with my argument? At this specific refine level, your argument is corrupted with duality and monism. There is nothing wrong with dualism. Yes, there is nothing wrong with dualism. But in your case you are using dualism to prove monism. You insist there is "that" something [out there, absolute] when in reality there is nothing to speak of. Physical of course is an illusion. Mind in your view is an illusion since it is emergent. Therefore everything is illusion. Illusion however cannot persist. Therefore your model of reality is wrong. There is of course something out there. Yes, everything in a way is an illusion. ILLUSION-A is a main set while reality is the subset. So there is nothing out there of reality-as-it-is, there is only the main set ILLUSION-A. Despite being encompassed by ILLUSION-A, human beings are being realistic within reality-as-it-is, i.e. the train on a train-track one is standing on is real, so jump off the track. The above statement is true regardless. Physical state is arrangement of physical. You cannot have a thing, mind, out of a configuration of physical. You simply believe on magic not being aware of it. You have a difficult time to show that such a thing is possible in your illusory point of view. You don't even believe that matter is real so there is nothing that reality can stand on it. I am not doing such a thing. I have been very precise defining the model. Mind is primary and matter is secondary. Whatever name is appropriate for it. You simply cannot build reality on top of illusion since illusion is subject to immediate destruction. I did not state 'matter' is not real. I have not denied the existence of matter. Matter is real for me to the extent we can do things with it. I can grow apples from seeds and eat the apples. What is "real" is objectively verifiable within an agreed Framework and System. What I do not agree is the claim, matter exists independently by itself. To insist on such is delusional, i.e. believing in illusions. Mind is a human mental state emerging out of physical states within an agreed or implied Framework and System. Note we can prove a mind exists via the natural human reproduction [combination of physical elements] process, birth and bringing up a healthy child. As in the above example of reproduction of a child, there is no "mind" if the child's brain is severely damaged, thus restricting the emergence of a mind. I think I understand you. You believe that human mind exists because it is emergent and reality exist as a result of human mind. You are bounding two things together where each is an illusion. Such a thing cannot change and persist. There is of course a mind involved unless the child is dead. Not reality exists as a result of human mind. I am NOT implying reality is dependent on human mind. Reality is co-dependent with human minds. Reality co-emerges with human minds. Note the very common Yin-Yang symbol I presented somewhere. In this case, one must avoid the unrealistic "chicken-egg which is first" dilemma. Nope there is is a hierarchy of mind from zero mind. In a severe coma where the child is not brain-dead, there is no active mind at all but the brain is still alive [with instincts] to sustain the basic requirement for survival. So, reality is Yin for example and human is Yang. These two complete each other? Not one human being but the collective of human beings past and present. To be more precise, Yin and Yang inter-complement each other which enable reality to emerge. 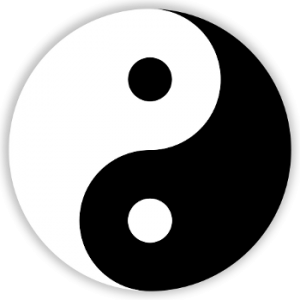 Are Yin and Yang something or they are illusion? Yin & Yang are things/elements i.e. as principles of substantiating the emergence of reality in one perspective. So they have an essence each which each moves things, like good and evil. There is no absolute essence. the essence of Yang is Yin. The un-nameable Tao is the interplay of the above. Note the black dot that is inherent in the white side and vice versa. So there are two essences. Two minds. OK. I am familiar with that picture. Yes, in the above case there are two essences in complementarity working as one. Note there could be >50 players of various musical instruments in one orchestra to produce a single song. The mind is an emergence from the brain>body>universe and the mind comprised of a hierarchy of sub-minds. E.g. note multiple personalities disorder. Familiar? then you should understand how its principles are applicable to reality. and they both interact dynamically in complementarity. In other words, p has an inherent potential of not-p and vice versa. It is mistake for you to think of black is black and white is white and the twain shall never mix, i.e. pure dualism. This is due to your psychological state. Thus your psychologically driven thinking that the 'physical' and the 'mind' are separate and independently dual. As such from the principles of Yin-Yang, the physical has an inherent mental [mind] potential and the mental [mind] has an inherent physical potential. There is no way to identify which comes first. That is the truth of reality-as-is which is an emergence of the intertwining of 'physical' and 'mind'. So you have mind and physical, what is caused by minds. That is true in my model too. That however doesn't resolve the problem of beginning. It just states that mind and physical are working together. The same is true for my model. This model however suffer from the problem that I mentioned before that two state of affairs, X and Y, cannot coexist at the same point. Therefore your model cannot have any dynamics.